This policy is a statement of the aims, principals and strategies for learning and teaching within the specific area of Mathematics. What does “Mathematics” mean in the Foundation Stage? In the Revised EYFS 2012 Mathematics is identified as a “Specific Area” of learning, alongside Understanding the World, Literacy and Expressive Arts and Design. We value each child as an individual, accepting their individual needs, interests and rates of development. We recognise each child as a competent mathematical learner. We aim to support children in recognising that their views count and that their opinion is valued e.g. in following children’s interests and ideas for topics in this area. We aim to use parents and other carers knowledge and skills wherever possible to extend the children’s understanding and experiences of mathematics. We aim to be confident and competent mathematical role-models for the children in our care. We aim to provide challenging, flexible, motivating resources and opportunities which support and develop the mathematical skills, independence, creativity and imagination of each child. We aim to create a stimulating environment which offers a range of activities to develop mathematical interest and curiosity both indoors and outdoors. 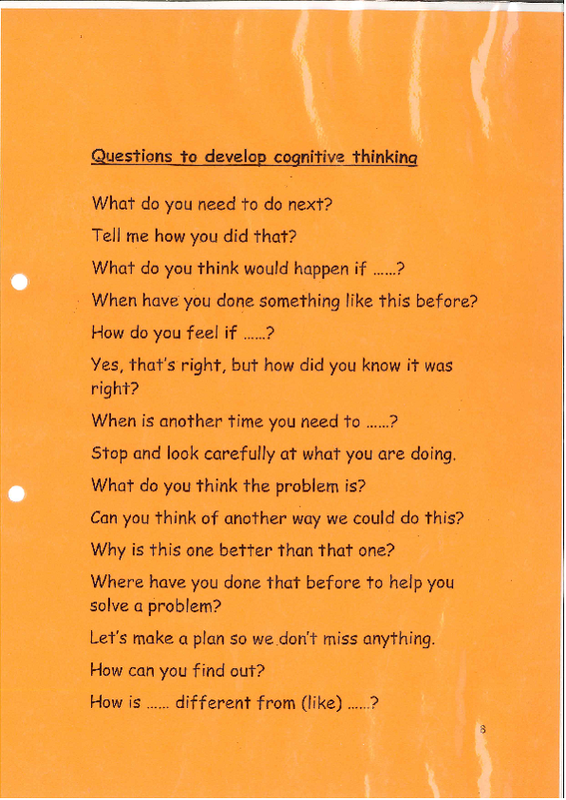 We aim to question children in a way which develops their thinking, extends their problem-solving opportunities and enhances their learning (see Appendix 1 Questions to challenge Children to THINK and TALK about their own Learning Process). have the time, space, resources and opportunities to develop, mathematical concepts and language during activities which arise out of the child’s own interests and curiosities (Project-based Learning) and adult-led activities. consolidate and extend children’s knowledge and skills through careful assessment, observations and planning. represent their own explorations of mathematical concepts. develop their understanding and confidence through practical “hands-on” activities both indoors and outdoors, which is supported by appropriate adult intervention, and which takes account of the preferred learning styles of individual children (visual, auditory and kinaesthetic). develop their understanding of and competent use of mathematics by offering a range of activities – some explicit and others which develop ideas more discreetly in activities such as role-play, songs and rhymes, everyday routines (such as group-time), walks in the local environment, interactive displays. ICT – (computer/non-computer). pursue and solve their own mathematical fascinations through offering them a rich and interesting environment in which they are encouraged to focus on their own thinking and not simply offering the adults “the right answer”. interact with a diverse range of multi-sensory, motivational resources which appeal to young children, takes account of those who for whom English is a second language or who may need to use alternative communication systems, and which promote independent learning, thereby enhancing their understanding, experience and enjoyment of mathematics. act as role-models, and help the children to see themselves as mathematicians and to develop positive attitudes towards learning and using mathematical concepts, by being confident and enthusiastic about the subject themselves. observe and listen to children to better understand their interests/curiosities and provide opportunities/resources for child-led learning. maintain children’s enthusiasm and confidence by responding to the children’s interests and lines of enquiry as well as planning practical and appealing activities which are appropriate for the children’s level of development, and which take account of different learning styles. We aim to support children who need practice in developing basic skills in maths (e.g. some children in receipt of Pupil Premium) and to challenge more-able children to use and apply their mathematical knowledge/skills. do not rush children to record numbers or symbols until they are ready to do so and see that it is purposeful e.g. price tickets on toys in the toy shop, shopping lists, recipes, measurements to build a den etc. i.e. recording numbers as an integral part of the play situation. use a wide-range of resources and activities both indoors and outdoors to develop the children’s enjoyment of mathematics in a varied and stimulating way. being supported to follow and develop their own fascinations (child-led learning/provision of a rich and stimulating environment/Continuous Provision) as well as being involved in explicitly mathematical activities i.e. planned, “focused” activities that are organised and led by the adult. being involved in play which is purposeful so that they can (with appropriate adult support) begin to appreciate mathematics in the world around them (e.g. numbering model houses so the postman can match letters to the right houses). being encouraged to talk “mathematically” about activities or observations. They are encouraged to develop their own strategies for solving mathematical problems. They are praised for their efforts in thinking about a problem, for guessing (estimating) and not just for giving correct answers. The Nursery’s 2-year rolling programme of 12 termly topics. Topics titled “Maths Stories” and “Number Songs and Rhymes” have a mathematical emphasis. Short-Term “Focussed” Key-worker Group-time planning. Within this session Key-workers observe, target and support “target” children – see Weekly Planning. Staff work to a “Target-List” for both Number and Shape, Space & Measures. Children requiring challenge or support are clearly identified. Staff can easily differentiate the activity to offer challenge or smaller steps as necessary. Families are invited to join staff and children in a bi-annual mathematics themed Family Fun-day – “Let’s Play Maths”. Individual Support Plans (I.S.P’s) for children with additional needs. Children’s skills and stages of development are observed and monitored by key-workers and the whole teaching team. Observations may be long or short and supported by evidence such as annotated photographs (using electronic software) or pieces of work when possible. Parents and Carers are encouraged to post their own observations of significant development or learning experiences to their child’s Learning Journey. Staff monitor then accept/decline parental contributions as necessary. Records of individual children’s progress and achievement towards objectives and ELG’s are kept electronically as part of each child’s electronic profile. These observations and records inform planning, identify specific targets for each child, may identify a learning difficulty or talent, and provide the school with the means to monitor cohort progress and collect data on the effectiveness of the provision. Data collected each half-term identifies children requiring additional support or challenge in the three strands of this specific area of learning. Children’s Progress in Mathematics is shared with parents/carers during the child’s Curriculum Consultation at the mid-point of their time at Nursery. This enables two-way sharing of information and the planning of “next steps”. Provision will be made to meet the individual requirements of children with any additional needs, to enable them to make progress in this area of learning and achieve their full potential, e.g. through specific targets as part of an Individual Support Plan. Where necessary, resources and equipment (e.g. a computer touch-screen) to support children with additional needs will be procured from other agencies. At Hadfield Nursery School we aim to offer children and their families a safe environment, free from harassment and discrimination, in which children’s contributions are valued and where racial and religious beliefs are respected. We aim to challenge discrimination on the grounds of gender or disability. All children will be treated as individuals and they will have full access to all elements of provision and opportunities in Mathematics, regardless of gender, ability/disability, race or cultural background. liaising with the Governor who has curriculum responsibility for Mathematics, in order to support their monitoring role.